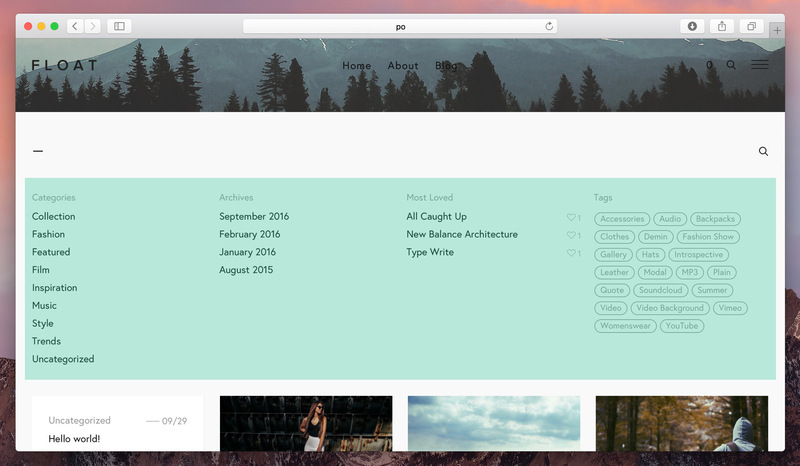 Now that you have published a few posts, you're ready to configure your blog archive page. The first thing you'll want to do is configure the header. To do this, navigate to the customizer via Appearance ➝ Customize and click the Blog tab. Here you'll see a large list of header configuration options for the blog archive page header, with descriptions for each option; from making the navigation bar transparent, to configuring a video banner. You can preview each option in real time as you make changes and before you save. The next thing you'll want to configure on the blog archive page are the blog widgets, which appear when the "+" icon is clicked on the top left. To do so, navigate to Appearance ➝ Widgets. There are two widget locations on the blog archive page: at the top and on the side. These locations are represented by the Blog Top Widgets and Blog Side Widgets tabs on the right, as highlighted below. 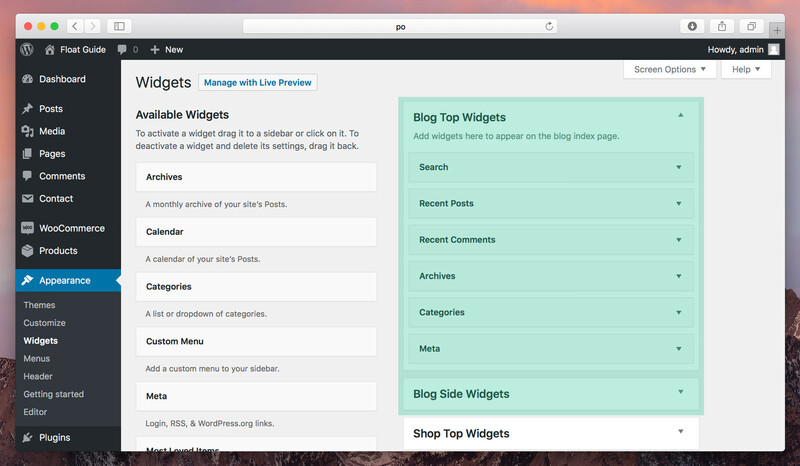 You can drag and drop a variety of widgets on the left in the Available Widgets section into each of these locations. Once a widget has been placed into a location, you can click on it for further configuration options. To set the widget locations that you want to display on the blog archive page, navigate to the customizer via Appearance ➝ Customize and click the Blog tab. Scroll down until you see the Top widget area and Side widget area checkboxes. Check either or both. 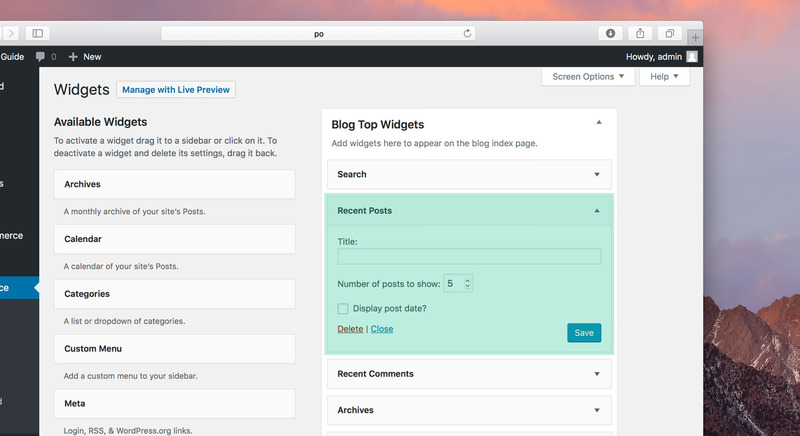 You can set the amount of post columns to display in the blog archive page. You can set this from 2 columns to 5. To do so, navigate to the customizer via Appearance ➝ Customize and click the Blog tab. 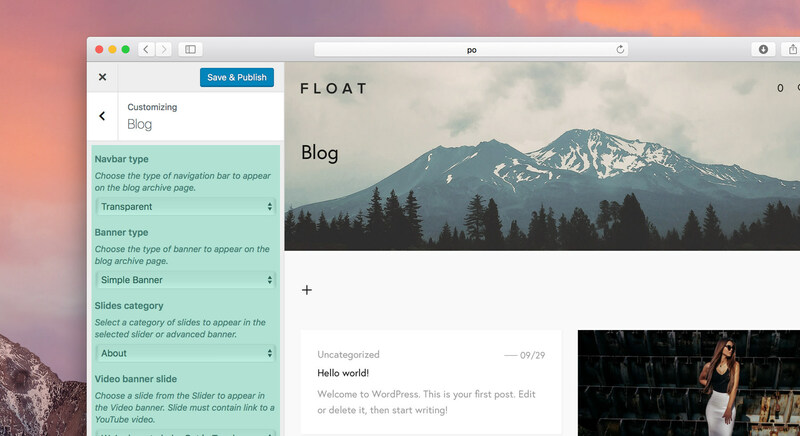 Scroll down until you see the Blog columns input field. Use the arrows to adjust the figure. The amount of post columns can not be adjusted when the Side widgets area is visible or on mobile devices. As you can see from the image above (below the Blog columns field), your can enable infinite scroll on the blog archive page as an alternative to a standard pagination. To so so simple check the Enable infinite scroll checkbox in the Blog tab of the customizer via Appearance ➝ Customize. Now that your archive page is configured, the last touch to add to your blog is an email subscription form. 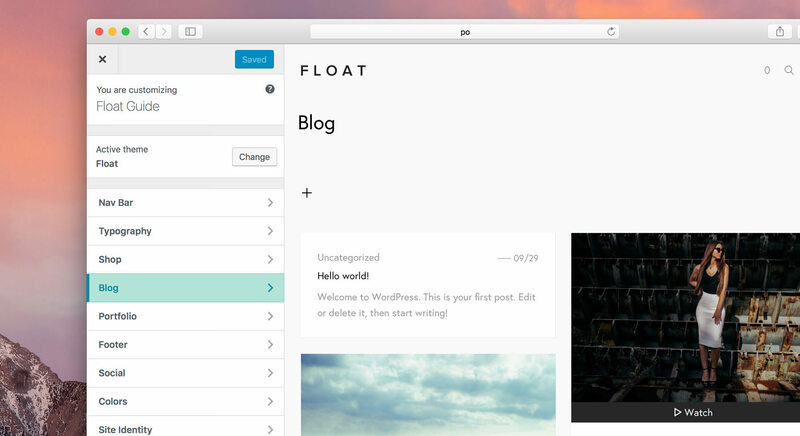 Float integrates with MailChimp to allow visitors to sign up to your email list via a form in the single post page (and footer. See Footer for more information). To configure your subscription form, first log into your MailChimp account and select Lists from the top menu. On the Lists page, click the arrow icon on the list you want to integrate and select Signup forms. On the following page, scroll to Embedded forms and click the Select button. In the Copy/paste onto your site section of the resulting page, copy the form action code only, as highlighted below. Paste this copied code into the MailChimp action form field in the Blog tab of the customizer via Appearance ➝ Customize. To insert posts within a page that that you have already created, use the Posts shortcode. See Shortcodes for more informarion.